There have been several waves of reforms in public administration, and public service delivery. Since the early 1980s the new public management wave has captured the attention of city managers and public administration theorists (Hood, 1991; Kettl, 1997; Osborne & Gaebler, 1992). New public management argues local government can become more efficient as a consequence of both market competition and adopting business-style management (Dunleavy & Hood, 1994; Megginson & Netter, 2001; Osborne & Plastrick, 1997). However, empirical evidence does not always support the superior efficiency of market delivery (Bel & Warner, 2007; Boyne, 1998b; Hodge, 2000), and city managers exhibit a more pragmatic and dynamic use of markets by contracting out some services and bringing other previously privatised services back in house through reverse contracting or reinternalisation (Entwistle, 2005; Hefetz & Warner, 2004; Sclar, 2000; Warner & Hebdon, 2001). New public management reform stresses that markets could be superior, whereas current trends in public administration and planning urge the public sector to interact not only with markets, but also with communities to encourage democratic deliberation and enhance local quality of life (Denhardt & Denhardt, 2000; Frug, 1998; Nalbandian, 1999; Nalbandian, 2005). This alternative reform has been coined the „new public service‟ in public administration (Denhardt & Denhardt, 2003) and „communicative planning‟ in the planning field (Healey, 1993). The result is a dynamic decision making process which integrates market mechanisms with citizen deliberation and voice (Allmendinger, Tewdwr-Jones, & Morphet, 2003; McGuirk, 2001; Rashman & Randor, 2005). The new public management has achieved broad acceptance, both in theory and practice, across the world (Kettl, 1997). 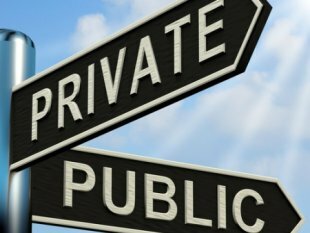 The new public service, which shifts emphasis toward public values and service quality (deLeon & Denhardt, 2000), is gaining interest among deliberative democracy theorists, but has not yet effectively challenged the hegemony of market based approaches to public service delivery. Communicative planning, by contrast, has obtained wide acceptance across the field of planning (Fischer & Forester, 1993; Healey, 1997). This has led some planners to articulate a theory of social choice which moves beyond the either/or dichotomy of markets or planning and argues for a balanced position where both markets and citizen deliberation can lead toward near-optimal solutions (McGuirk, 2001; Sager, 2001). By bringing together theoretical streams in both public administration and planning, we outline an ideological shift in theory. Using local government service delivery data from municipalities across the U.S for the last decade, we are also able to demonstrate a shift in practice. do so, they paired ICMA survey responses over time. They found, surprisingly, that the level of reverse contracting was two thirds the level of new contracting. In this paper, we follow their methodology and look at the most recent data available for the period 1997-2002. In the earlier period 1992-1997, new contracting out was 50 percent larger than the level of reverse contracting (18 percent vs. 11 percent). In the most recent period, 1997-2002, the proportions flip and reverse contracting is preferred (at 18 percent of all service delivery) over new contracting out (which falls to 12 percent). We find that stable public delivery over the two paired time periods, 1992-1997 and 1997-2002, remains the most common form of service delivery at 44 percent, and stable contracting, at roughly 27 percent of all service delivery, is also unchanged. What is interesting is the dynamic behavior at the margin. To understand the dynamics of this shift, we build models for new contracting out and reverse contracting for each of the two paired time periods. Our explanatory variables provide empirical proxies for various conceptual concerns of new public management, new public service and communicative planning. We find the theoretical shift from new public management toward new public service and communicative planning mirrors a shift in practice. However, our empirical analysis provides evidence of a managerial and political learning process over the decade that moves beyond the market vs. planning dichotomy of the theoretical debate and embraces the more comprehensive approach of social choice that balances attention to both market management and citizen voice.